The new holiday, which is celebrated every third Thursday in May, Vyshyvanka Day, has appeared in Ukraine recently. This year, the date was May 17. Symbol of the holiday – ethnic Ukrainian shirt-vyshyvanka. It is customary to wear clothes (shirts, blouses, dresses) and accessorize with vyshyvanka. 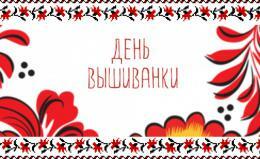 The holiday has no official status, but it is recognized throughout Ukraine. The parades of vyshyvanka and various events were held on May 17 in many cities of the country. Some stations of the Kiev Metro have for some time carried out a free ride in the metro for those who were dressed in vyshyvanka clothes. The custom of wearing clothes with vyshyvanka has come out far beyond the borders of Ukraine. Traditional vyshyvanka is popular among many world stars. In 2015, the prestigious magazine Vogue called vyshyvanka one of the main trends of the season.